GearBuyer has the largest selection of dome tents from the best brands. Discover a wide variety of dome tents from Coleman, Kelty, The North Face, Mountain Hardwear, and more. Dome tents have three or more intersecting hoops with the tent cover to form a multi-faceted ground floor with a dome. The added hoops give a dome tent increased strength in comparison to other tent styles. GigaTent Mini Explorer Toy Dome Tent - The Giga Tent Mini Dome toy tent is fun for kids of all ages. Let their imagination take over as they play camping games with their action figures, dolls or stuffed animals. Very simple to set up and will provide hours of good clean fun. Dimensions - 15"x15" 1 ft Center HeightGreat for kids or small petsEasy to set up. Rei Camp Dome 2 Tent - Ideal for 3-season camping, the REI Camp Dome 2 is durable, trustworthy and a cinch to pitch—and it's offered at a sweet price!Imported. Polyester taffeta rainfly and a bound, cut-in floor provide a taut, water-resistant pitch; polyester fabric also resists UV degradation2 doors with awnings provide weather protection, easy access and ventilationDurable, equal-length aluminum poles and pole-clip design offer quick setupMesh storage pockets inside tent keep small items organized and off the floorIncludes compression stuff sack, pole and stake bags, 4 stakes, 2 guylines with tighteners and pole repair tube. Rei Camp Dome 4 Tent - Ideal for 3-season camping, the REI Camp Dome 4 is durable, trustworthy and a cinch to pitch—and it's offered at a sweet price!Imported. Polyester taffeta rainfly and a bound, cut-in floor provide a taut, water-resistant pitch; polyester fabric also resists UV degradation2 doors with awnings provide weather protection, easy access and ventilationDurable, equal-length aluminum poles and pole-clip design offer quick setupMesh storage pockets inside tent keep small items organized and off the floorThe REI Camp Dome 4 tent includes compression stuff sack, pole and stake bags, 4 stakes, 2 guylines with tighteners and pole repair tube. Napier Dome-to-Go Tent - Quickly transforms your hatchback car or station wagon into a comfortable home away from home. 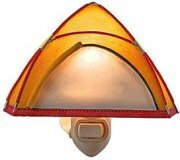 No need to worry about pesky bugs finding their way into the tent, simply adjust the adjustable vehicle sleeve to allow for a custom fit to your vehicle..
GSI Outdoors Dome Tent Nightlight - This adorable hand painted resin Dome Tent Night Light is UL approved and includes a swivel plug. When lit it will bring back fond memories of your favorite night's camping trip. Light up a dark hallway, your kitchen or your bathroom with this terrific and unique night light. Imported. Great gift or Stocking StufferSwivel Plug110VWeight = 6 ozHand painted resinOn/Off switchUL - CUL approved. Eagle's Camp Crystal Canyon Backpacker Dome Tent - A backpacker’s paradise that sleeps two. Weatherproofing Ever Dry™ keeps rain and moisture out, and is enhanced with factory-taped fly and floor seams. Reflective rain fly reduces temperatures inside. Organize gear via the storage pocket. Bug-resistant mesh screen. Quick-and-easy assembly. 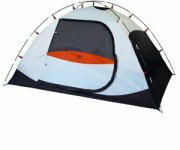 Includes fiberglass poles, tent stakes, fly and zip-close polyester duffle. Weight: 5 lbs. 3 oz. Center height: 3’3". 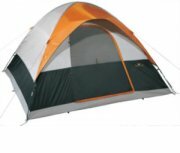 Floor dimensions: 5’ x 7’..
Cabela's West Wind Dome Tent 4-Person - This 4 person tent is loaded with features at an incredible price. Free-standing, five-pole design for superior stability. Shock-corded fiberglass poles with quick clips for fast, easy setup. Constructed of rugged nylon taffeta. Includes attached guy lines, stakes and carry bag. Imported. Capacity: 4 people..
Trekker 10' X 8' Dome Tent - From the backyard to the backcountry, these tents perform at a level well beyond what you might expect for the price. Construction highlights include 185T polyester taffeta fly and tent walls with 1,000mm waterproof-rated coating on fly and 600mm waterproof-rated coating on tent walls. The shock-corded fiberglass poles connect quickly for sturdy support. Spacious top and mesh walls, matched with the mesh screen on the door, deliver excellent ventilation. ALPS Mountaineering Meramac 6 Person Dome Tent - Free standing 10 x 10 - 2 pole design with shock corded 11 mm fiberglass poles. 75D 185T polyester fly resists UV damage and stays taught. Factory sealed fly and floor seams give best weather protection. 75D 185T poly taffeta floor with 1500 mm coating. Two doors with windows for easy entry with single zip operation and great ventilation. Extra large #8 zippers on both doors for extra durability. Trekker 12' X 10' Dome Tent - A money-saving value on a spacious shelter. This dome tent’s shock-corded fiberglass poles set up quickly, supporting the 185T polyester taffeta walls and fly. The 1,000mm waterproof-rated coating on fly and 600mm waterproof-rated coating on tent walls shield the interior from rain. Large top and mesh walls, combined with a mesh screen on the door deliver excellent airflow. Use the Power Pocket™ for easy external access to a power cord. 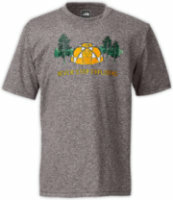 The North Face Dome Tent Reaxion Tee - The North Face Boy's Dome Tent Reaxion Short Sleeve Tee feels and looks like a cotton tee but breathes and dries like a technical tee. VaporWick moisture-management technology helps to keep him cool, comfortable and dry during outdoor adventures. Relaxed fitSoft, comfortable, easy-care fabricConstructed of 100% polyester jersey fabric. Printed graphic at center front. VaporWick moisture management technology keeps you dry and comfortable. Import. Ultraviolet Protection Factor (UPF) 50 shields skin from the sun's harmful ultraviolet rays..
Eagle's Camp Dome Tent - 7' X 7' - From individual campers and couples to small families and groups, Cabela's has a dome tent to suit your needs. Though great for camping spring through fall, this 3-person tent is especially suited for warm-weather camping. Tent has generous mesh on the side windows, doors and tops for superb ventilation. It also has a special silver-colored coating to reflect sunlight and keep interiors cool. Tent and fly material is sturdy polyester taffeta that's polyurethane-coated for extra water resistance. Bass Pro Shops Three Person Dome Tent - A great tent for weekend outings, the Bass Pro Shops Three Person Dome Tent's easy set up and roomy design helps provide a pleasant camping experience every time out. Lightweight tent features durable 190T polyester taffeta walls with a 600 mm PU coating, 230 gram polyethylene bathtub floors with welded seams, and a 190T polyester taffeta rainfly with a water shedding 1200mm PU coating and taped seams.